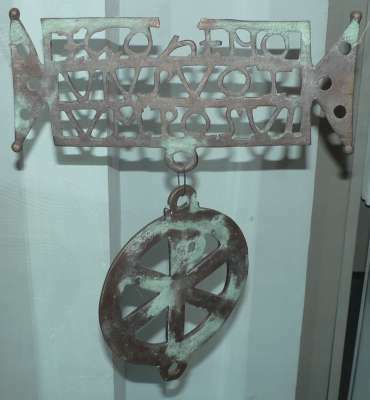 The votive plaque (donarium) found at Biertan near Sibiu is made of bronze, being composed from a tabella ansata (table with handles) bearing the inscription EGO ZENOVIUS VOTUM POSUI and from a disk with the monogram of Christ, chi - rho. The Latin inscription translates by I, Zenovius, kept my promise and put this offering (oblation) - votum meaning in Latin "promise made to a god in exchange for granting a wish". In the times of Romans, a rural Roman settlement (belonging to the Dacia Superior province) - the name of which was not preserved - stood on the present day territory of the commune of Biertan. The plaque was discovered in the 17th century, being rediscovered inside the collections of the Bruckenthal Museum in 1941 by professor K. Horedt. Dated through its perforated ornaments and the shape of the letters back in the 4th century, the plaque proves the continuity of Romanian Christian ancestors in the nowadays Transylvania subsequently to the legions withdrawal under emperor Aurelian. The Biertan plaque spans 32.5 cm long, 12.6 cm wide, the disk being 19.5 cm in diameter. 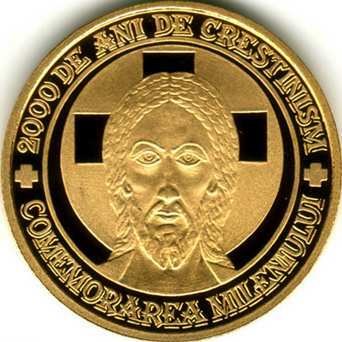 It is one of the oldest Christian artifacts found on Romanian territory up to present. The disk bears the monogram of Jesus Christ, HR (XP in Greek capitals, P being written over X), the famous ensign made up of letters chi and rho overposed. In the times of persecutions Christians developed a symbolic type of art, using images that were interpreted with Christian meanings. Most spread Christian symbols were the fish, the pigeon, the anchor and the Good Shepard amid his sheep. The countenace of Jesus is inspired by a mosaic in Constantinople, dated in the 4th century. The Byzantine painting placed the image of Jesus inside a medallion in the highest point of the church with archangels surrounding it. The image is the one of the Almighty heavenly emperor - Pantocrator. The actual system of time measurement since the birth of Jesus Christ was introduced by Dionysius Exiguus (Dionysius the Small, monk in Scytia Minor - nowadays Dobrogea in Romania - that lived approximately between ~470 and ~545). He introduced our era, Christian Era, known also as Dyonisian Era, (anno Domini), replacing in doing so the Era of Diocletian that was in use at the time, having actual year 284 AD as starting reference. The reason was simple: a persecutor of Christians did not deserve the honor of years to be counted since his ascension to power. With little corrections, the chronology of Dionysius Exiguus is still in use today almost in the entire world. 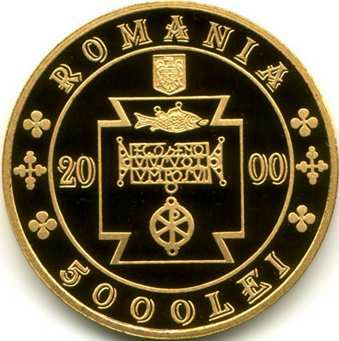 The gold coin pictures above are present on Romanian coins through the kind permission of Mr. Radu Lissner.